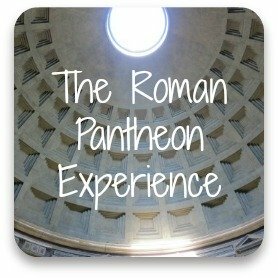 Rome's Pantheon : What exactly is inside it? 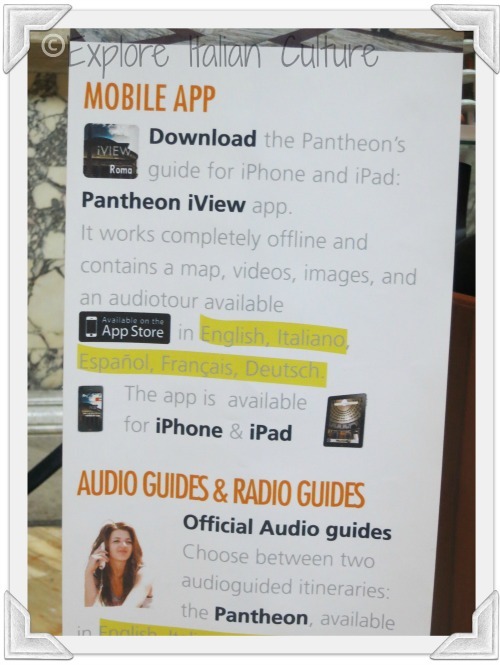 Rome's Pantheon : a guide. Going to Rome and feel you should see the Pantheon but not sure what's in it or where it is? You need this guide! It's one of the most amazing buildings in Rome, but not many people have an idea of what it is or how it grew. Knowing even a little bit about what's inside will make your visit much more enjoyable. 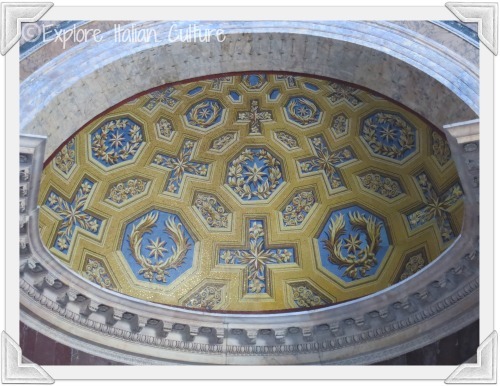 This stunning gold and sky blue mosaic design is somewhere inside the Pantheon. If you don't know where to look for it - read on! The Pantheon inside : tombs and chapels. Hard as it is to stop staring upwards at the oculus, we really need to start looking down and around the inside of the building, which is beautiful. As you look round the walls you'll see eight separate recessed spaces. Three of them are tombs : one the final resting place of the great artist Raphael, the other two are Kings of the unified Italy, including Vittorio Emanuele, known as the 'Father of the Nation', whose tomb is often guarded by a volunteer. Four of the remaining recesses are chapels dedicated to St Joseph, the Madonna of Clemency, the crucifixion, and the annunciation. Take time to stand and look, as other tourists dash by. Each of them is beautifully decorated with fine Renaissance art - frescoes, paintings and sculptures. 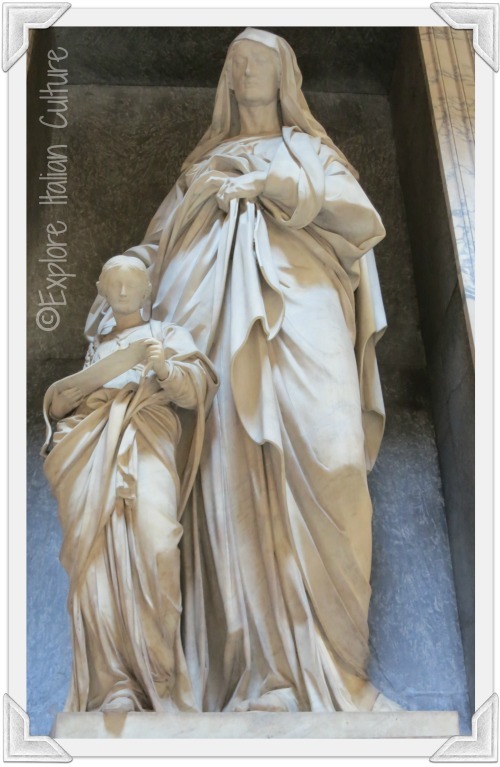 You will find this sculpture in St Joseph's Chapel within the Pantheon. Rome's Pantheon as a modern church. The final recess is the high altar. 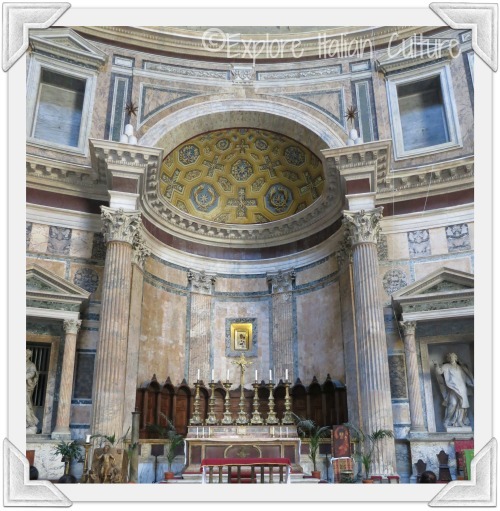 It's important to remember that, whilst most visitors go to the Pantheon to see a monument, it is a modern working church, the current name of which is the 'Basilica of Holy Mary of the Martyrs' (Sancta Maria ad Martyres). The high altar and look - there's that mosaic I mentioned here! It's not unusual for Mass to be celebrated amidst the throng of visitors around the recess containing the sumptuous high altar. You'll find seats here where you can pray, or just sit quietly and take in the beauty of it all. With so many sights competing for your attention, it can be hard to remember to look down - but that would be a mistake. 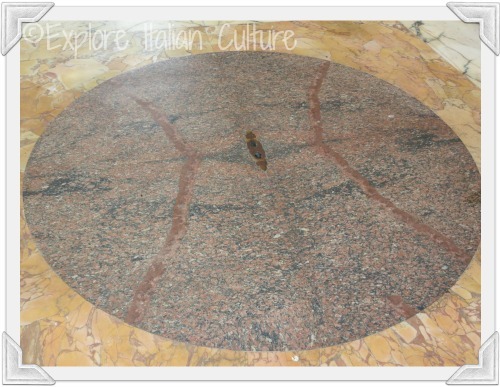 The floor is set out in a regular pattern of squares and circles in fine marble with rich reds, warn yellow browns and stark black and white. This pattern radiates from a central disc of bronze which contains holes to allow the rainwater to drain away (it does sometimes rain in Rome!). Part of the beautiful marble floor with bronze drainage hole in the middle. The whole floor dips inwards to help the drainage. To stand and watch the rain fall through the oculus is quite a sight. A secret wish for me is to see snow fall through there, but given that snow is a rare event in Rome, I may have quite a wait. If you're in Rome in the winter months, you may just be lucky! How to find it and when to go. You'll find Rome's Pantheon in the Piazza Della Rotunda, but from all sides there are brown monument signs pointing the way. It's open Monday to Saturday, 9am to 7.30 pm, and Sunday 9 till 6pm. Although it's a very popular tourist destination, there are never the lines you'll find at St Peter's, and almost always you can walk straight in. As with any other working church in Rome, visitors are asked to act with respect. Be modest in clothing, (no bare shoulders for women, no hats for men) and do not make too much noise, so as not to disturb people praying. In fact, silence is requested when a service is taking place. Look out for the self-guided tour sign. It is possible to book a guided tour for 40 Euros for a maximum of four people, or there's a good audio guide which is informative but not overwhelming and available in a range of languages, which helps make sense of what you're looking at. Both are available at the information desk which is on the right hand side as you go into the main body of the church. But never forget just to take the time to look around, savour it and make the experience your own. After your visit there are a number of places on the Piazza to have something to eat or an ice cream. They are near a major tourist attraction in a capital city so they're not cheap - but not crazy prices either, and they offer good value. One final 'what to see' tip. 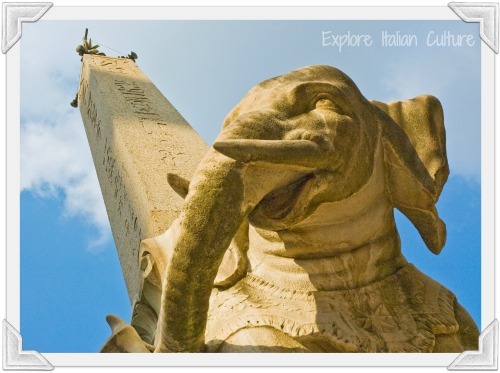 If you come out of the main door, turn right, go to the end of the Pantheon and turn right again, about 100 yards along that street you will see Bernini's wonderful elephant statue - a sight not to be missed. Kids, particularly, love it. 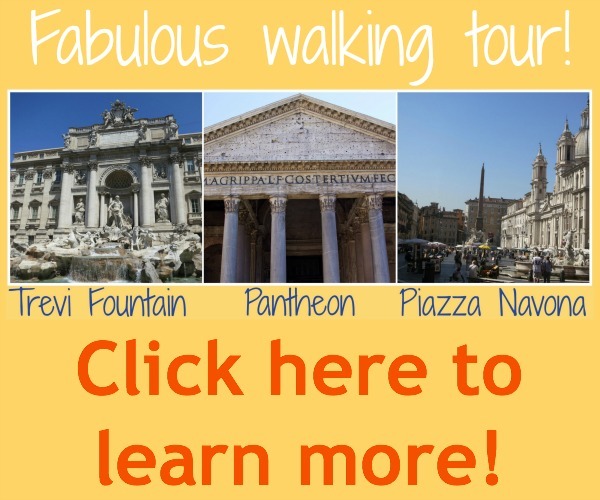 Combine the Pantheon with two of Rome's other must-see attractions! 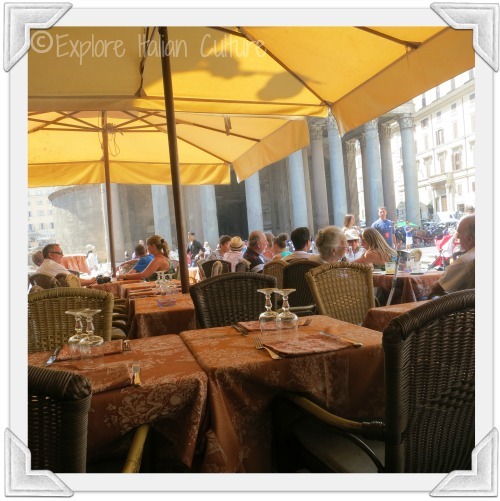 The Pantheon and Piazza Navona - history and romance combined - a must-do on any Rome sightseeing tour. And of course you just cannot leave Rome without seeing the famous Trevi Fountain! We have partnered with one of the most trusted of all tour companies in Italy, Viator Tours, to provide you with an amazing guided walk seeing all three. Learn their history, experience their magic - it's a breathtaking combination. Just click on the picture above to go to Viator's page where you can see how satisfied other people have been before you book. Finding out more about Rome and its Pantheon. 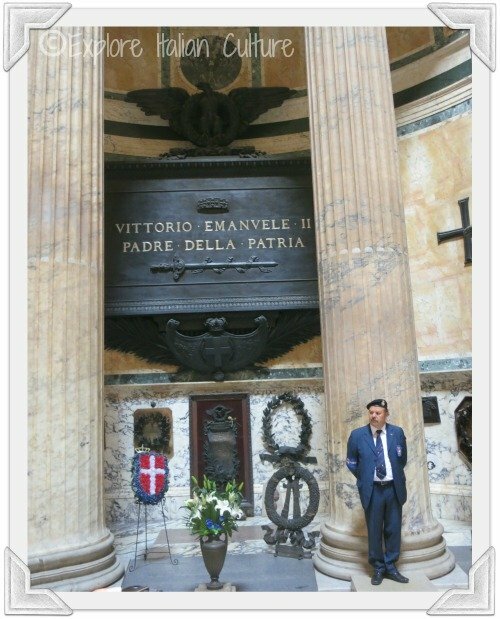 Did you miss the first page about the impact of the Pantheon in Rome, including information about its famous 'oculus'? Click on this picture to go there now!